A recurrent theme any study or discussion of how young people will participate in the EU referendum is (and will most likely remain) their reluctance to do so. According to our latest data, around 70% of Millennials are likely to vote, while one in ten are certain not to. This compares with 85% of the wider electorate who are likely to vote, and only 4% who have no intention of doing so. While the actual figures on the day will be different – people frequently over-estimate their likelihood of voting in surveys, and the campaigns may manage to mobilise some and/or put off others over the next three months – the fact is that the Millennials are likely to be under-represented in the final result. Even in the Scottish Independence Referendum, when turnout was particularly high – including among the under 30s – the youngest voters were still less likely to vote than their elders. A common theme in subsequent explanations for the Millennials’ low turnout will be young people’s ‘alienation’ from the campaigns or ‘lack of trust’ in their messages and the people behind them (examples of such explanations around the 2015 general election can be found here, here and here). However, a growing body of research is increasingly undermining the conventional wisdom that the Millennials’ lack of participation in electoral politics is a result of alienation. My research, for example, has shown that the Millennials are surprisingly un-alienated compared with their elders, and that it is their unusual apathy about politics which deserves more attention. In our survey, we gathered data on a specific aspect of political alienation – trust in the referendum campaigns – to examine the role it might play in explaining why the Millennials report being so unlikely to vote in the referendum compared with their elders. We asked respondents which campaign – Remain or Leave – they trusted the most, or whether they trusted both campaigns equally or not at all. The responses (for the entire sample) are summarised below. 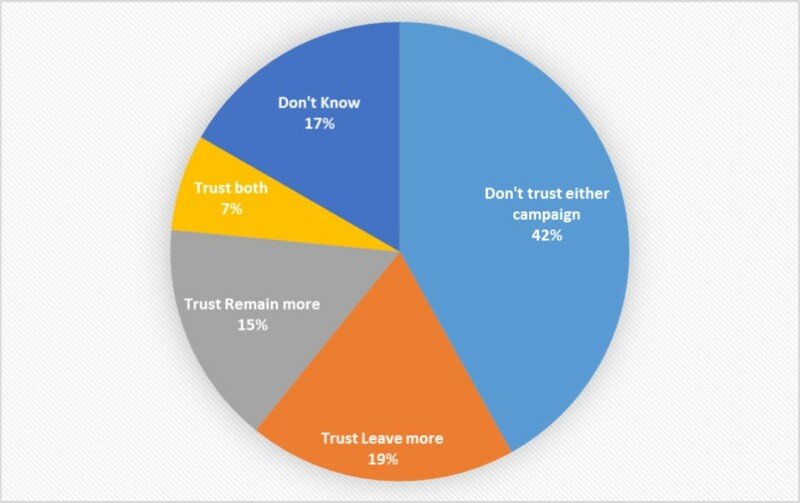 In an age when expressing trust in a politician is likely to lead to queries about your mental health, and in light of the somewhat negative nature of both the Remain and Leave campaigns so far, it is perhaps not surprising that 42% of voters do not trust either campaign. In fact, it is more surprising that another 42% have at least some trust in one or both of the campaigns. There is little difference in terms of how much trust one campaign enjoys compared to the other, with Leave being slightly more trusted than Remain. There is also little indication that the support for either side is dependent on them being trusted by voters: 43% of those currently planning to vote to remain in the EU, and 39% of those currently planning to vote to leave, do not trust either campaign. Turning to the Millennials in particular, Table One shows their trust in the campaigns compared with their elders. The results are consistent with the view that the Millennials are a distinctly un-alienated generation and have unusually high levels (relative to their elders, at least) of trust in politics. Only 35% have no trust in either campaign, compared with an average of 44% among the older generations. There is little evidence that trust is affecting the chances of the Millennials voting in the referendum: 34% of those who report being unlikely to vote (i.e., give a score between 0 and 4 on a scale from 0 to 10 representing the likelihood of voting in the referendum) have no trust in either the Remain or Leave campaigns, and this compares with 35% of those who report being highly likely to vote (i.e., give a score of at least 7) who also have no trust in either of the campaigns. There is little sign, therefore, that political alienation – in the form of a lack of trust in the integrity of those leading the Remain and Leave campaigns, or in the information being received about the consequences of staying in or leaving the EU – has much of a role to play in explaining why Millennials may be un/likely to vote on 23rd June. There is evidence, however, that political apathy is important. When asked to rate their attention to politics on a scale from 0-10, where 0 means they pay virtually no attention, those Millennials who are unlikely to vote gave an average score of 4, while those who are likely to vote gave an average score of 7. 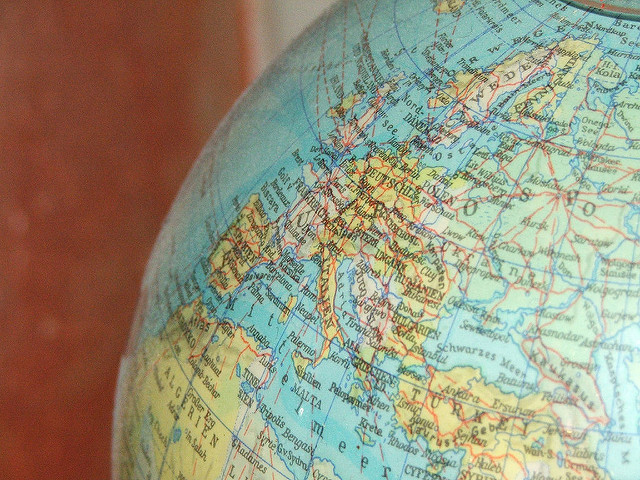 In contrast with trust in the campaigns, there is a clear relationship between being interested in and engaged with politics, and intending to participate in the EU referendum. If Britain votes to leave the EU in June, barring some dramatic event before then that affects millions of voters, it is quite possible that low turnout – especially among the overwhelmingly pro-EU but (relatively) vote-shy Millennials – will be one of the key causes. If that happens, the Remain campaign’s failure will not stem from their inability to overcome the scepticism of the Millennials about the case for why they should vote to stay; it will stem from their inability to engage them with the campaign in the first place.